Congratulations on your upcoming wedding! We would love to be a part of your special day. 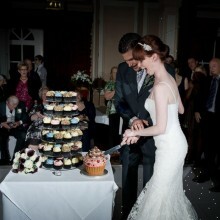 What do you do at Ms. Cupcake for weddings? 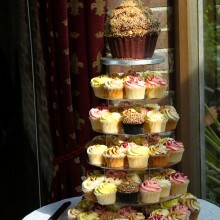 We can make Cupcakes (which you can display on a tiered stand) or Round layer cakes. What does Ms. Cupcake NOT do? We do not make traditional sugar-paste covered fruitcakes or multi-tiered ‘stacked’ cakes. We do not make sugar-paste floral arrangements or complex sugar-paste decoration on the cakes. We do not charge extra for weddings. You pay the same price regardless if you are ordering a cake from us for your auntie’s birthday or your wedding. Do you deliver or do we have to collect? You can collect from our Brixton shop free of charge or we can arrange courier delivery for you within London for an additional fee. The fee is dependent on your postcode. Our delivery time slots are 9am-1pm, 12pm-4pm, 3pm-7pm each day of the week. Anything further afield and you will need to collect from our Brixton bakery or arrange your own delivery. What flavours and designs can I have? We have a seasonal flavour listing for each different season. Just ask us for the correct one to tie in with the date of your wedding. We decorate all our cupcakes and layer cakes in our soft ‘buttercream’ style of icing. We have three types of icing style – traditional (streamlined, clean lines), roses design (piped roses all around the cake), or an edible picture design. No, we do not hire or sell cake stands. We can however point you to some websites that sell them! A lot of people will buy new ones and then sell them on eBay after the wedding, so that is always a great option too. Multi-tiered cupcake stands usually can be assembled using as few or as many tiers as you want, so don’t worry if the one you have gotten is too big – just don’t use all the tiers. If you are looking to get a selection of layer cakes, you can find stands that are called ‘C stands’ or ‘E’ stands where the cakes sit on each tier on their cake boards (which we provide). How much cake will I need? If you will be having a dessert in addition to the cupcakes/cakes, we recommend that you assume only up to 75% of your guests will actually have a cupcake or a piece of cake as well. The 9″ cakes feed around 12 – 16 people – the 12″ cakes feed around 25 – 30 people. In order to not have to charge extra for wedding orders, we do not offer a tastings service. However, we always have at least eight different flavours of cupcakes available for purchase at our Brixton shop, which is open 7 days a week, so please pop by! If there is a particular flavour you are desperate to try, email us a week before you plan to come to the shop and we will do our best to have that particular flavour available for purchase on the day you come to visit. How long do the cakes last? How do they need to be stored? All of our products are ‘ambient’ which means they are best kept at room temperature. Do not store in a refrigerator as this will dry out the cakes. If kept at room temperature you can expect freshness as follows: Cupcakes – 2-3 days and Layer cakes – 4-5 days. Cupcakes and Layer cakes made without gluten have a shortened shelf life. They are best consumed within 24 hours of collection/delivery. 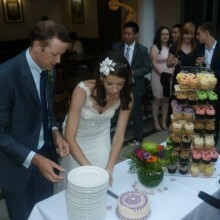 You can freeze our Cupcakes and Layer Cakes for up to 3 months before or after your event. Can you make cakes for people with allergies? Ms. Cupcake is an entirely vegan bakery. This means everything we make is dairy-free, eggless and both vegetarian and vegan. We can also make cakes without wheat, gluten, soya, or nuts on request. Please note: Wheat, gluten, soya, and nuts are all used in our bakery, so we cannot guarantee against trace amounts in the cakes. We book up quickly at Ms. Cupcake – so the sooner the better! Our absolute deadline is full payment at least five full days prior to your order date. How do I place an order? We recommend contacting us by email – info@mscupcake.co.uk so we can get all of the specifics of what you need exactly right. Once we know all the details, we will send you an invoice that you can safely pay with a card online. Please note – 100% of the balance is due at the time of placing the order. Alternatively, you are welcome to order on our website or at our shop in Brixton. Congratulations again – and happy planning!